THERE ARE ONLY A HANDFUL OF BANDS THAT HAVE MASTERED THE ART OF MELODIC ROCK AND STATION HAVE TO BE AT THE TOP IN THAT REGARD. 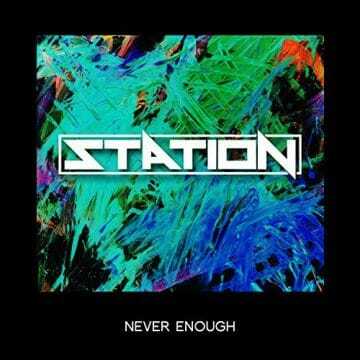 AFTER RELEASING THEIR STELLAR EP ‘WIRED’ IN 2014 AND THE IMPRESSIVE 15 TRACK SELF-TITLED ALBUM IN 2015, STATION ARE BACK WITH A BRAND NEW STUDIO ALBUM ENTITLED ‘MORE THAN A MOON’ AND A VIDEO FOR THEIR SINGLE “I WON’T BREAK YOUR HEART.” SLEAZE ROXX IS HONOURED TO HAVING BEEN GRANTED THE FIRST INTERVIEW WITH THE GROUP (VIA THE AFFABLE GUITARIST CHRIS LANE) LEADING UP TO THE RELEASE OF ‘MORE THAN THE MOON’ AS WELL AS HAVING HAD THE OPPORTUNITY TO ALREADY HEAR AND REVIEW THE GROUP’S MELODIC MASTERPIECE. 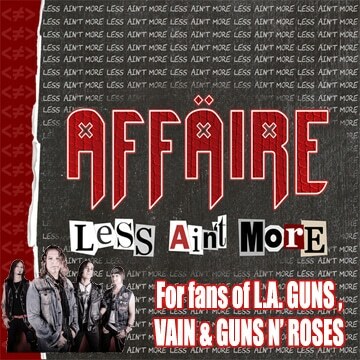 Sleaze Roxx: So let’s talk a little bit about the new album ‘More Than A Moon.’ How did you guys come up with the title? Chris Lane: It’s one of the songs actually on the album. Sleaze Roxx: Is there any significance on why you chose that title? Chris Lane: It’s actually just been a song that we had for a very long time and when we started talking about the second album and what it would be called, we were going back and forth naming it something that was completely — like, you know, ‘Physical Graffitti’ — a stand alone name. We pretty much [laughs] didn’t think any of the song titles sounded very good as an album title except for ‘More Than A Moon.’ So, because it’s been in our catalog for so long and we feel it’s the song that a lot of people that have seen us live actually know but know it’s not recorded, it was just a good idea to put it there and say, “Look. It’s us and it’s kind of what we are putting out.” So we went with something that sounded familiar to us. Sleaze Roxx: Your album covers have always been pretty simplistic. How did you come up with the cover for this album? Chris Lane: So the dots are actually the phases of the moon. So it goes from waning to half, to waxing to full, to waxing to half-waning going down. We like really very simple things. We don’t like busy — really anything. And the other side of the thing is that in today’s world where most people see things on a small screen…. It’s not like, you know, a large piece of vinyl anymore. Having things that are very detailed and very very busy, I feel that things get lost. The artistry is totally there and I love that stuff but it’s not a great idea in my opinion to have someone look at something on a tiny screen that is hard to figure out what it is. So I like the simplicity of the art to it. Sleaze Roxx: That’s cool. In terms of the songs themselves, they are very melodic. So take me through the writing process for the album. Chris Lane: Well, most of the songs are new within about a year and a half. One thing that we are constantly doing is constantly trying out new music. We play live so frequently that we have the ability to just throw things in and see how we feel. We very much believe that there’s kind of a difference between a studio song and a live song. It’s just depending on what you want to make out of it and on this album, we really took advantage of being in the studio. You know, when we did the first one, we pretty much took our live set and recorded it. You know, I mean I thought that it was a good thing and we felt very strongly about the songs but we perform as a five piece, sometimes a six, so on the first album, there are six parts. There are a couple of little add-ons. I was like, “Oh, it would be cool if we had this. Certain songs, we got a little deeper like “One And Only” where we used a lot of keyboards and things like that. On this one, we kind of said, “Here is a song…” — we have a song called “Losing You.” Here’s a song that in order to actually recreate live, I need an arsenal of guitar players. Order our debut album here: http://stationnyc.bandcamp.com or http://itunes.apple.com/us/album/stat… Vocals – Patrick Kearney Guitar – Chris Lane Bass – Emi Asta Drums – Jimmi Kane Directed by Adam Gendler Special Thanks to Jennifer Leah Gottlieb http://www.jenleahgottlieb.com/ https://www.facebook.com/MissBoxofJunk Huge thanks to World Cafe Live and The Levy family for everything they did to help make this video! 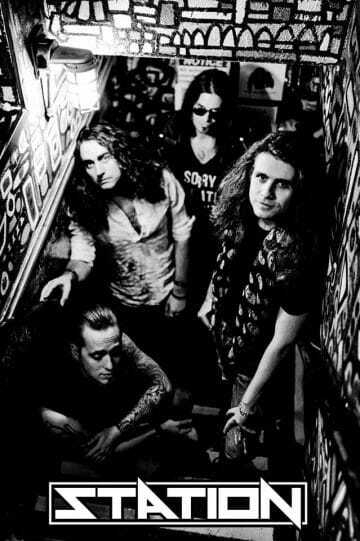 Sleaze Roxx: That’s one thing that Station does a little bit differently is that you’re really a four piece band but sometimes live, you have five or six people. So how does that work? Most people usually, whatever they play on the album, they can recreate live pretty much note for note, but you guys seem to be a little bit different in that way. Chris Lane: Yeah. You know, so we’ve always been a four piece in terms of… We believe very strongly that there has to be kind of dominion over your instruments. One thing that I kind of cherish about the guys is that when we work together, we can say anything to each other about anything. You know, somebody does not like what I am doing on the guitar… If the drummer says, “Stop.” It’s a conversation. There’s no, “I play the guitar. I make the guitar. You can’t talk about the guitar.” That kind of stuff. So when we first started Station, if we were going to have that mentality, it would be very difficult — especially in my position as a guitar player — to have another guitar player where it’s my vision for what I’ve written in the songs changes the orchestration of what they’re playing, it’s kind of breaking my own rule to start going after them and being, “Wait a second, you can’t do that because it changes what I want and now we have…” You know what I mean? It just doesn’t work as easily. When we first started playing live, we played as a four piece and we said, “We like doing it like this but ideally, we have a thicker bigger sound.” Because our music is so much more — like you said, it’s melodic so there’s a lot of padding underneath the vocals and the lead guitar. I always compare it to a cupcake. We got a lot of cake, and Pat and I are the icing right on top, but we need a really dense cake to make the icing taste as good as it does. So you know, we usually have Zach, our rhythm guitar player whose been with us forever. We bring him on to select shows typically as a hired player to come in and play with us. But he’s very much a member of the Station family so it’s just a different kind of business relationship so much and a studio relationship. 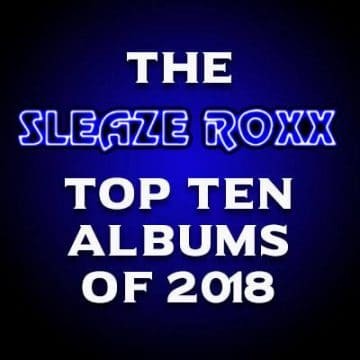 Sleaze Roxx: What are your favorite songs on the new album? Chris Lane: I think my favorite song is [pause]… I don’t know. It’s hard because I have different favorites for some reason. So like “Losing You”, I love that song because it just allows me to geek put in every possible way instrument wise. I think my favorite actual composition though is “Easier Said Than Done” just in terms of like song structure, what the song is about, the lyrics… I think that song overall is what I like the best. 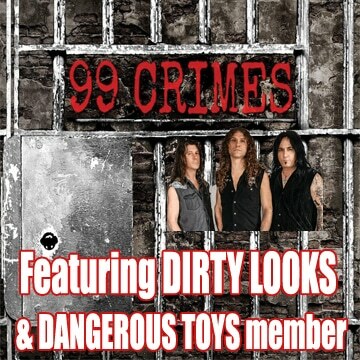 Sleaze Roxx: How many new songs do you intend to put into the live set? Chris Lane: All of them. Sleaze Roxx: All of them? Chris Lane: Yeah, yeah. We are going to be on tour in May for a little while and for one of our shows, I think that we play for 160 minutes. 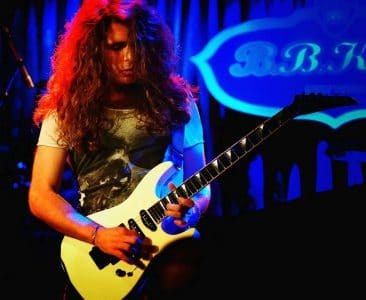 Sleaze Roxx: You must be a big fan of [former Deep Purple guitarist] Ritchie Blackmore. 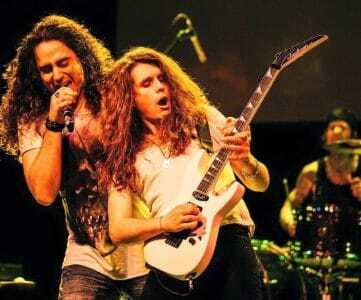 Chris Lane: I love Deep Purple! Sleaze Roxx: There’s obviously a lot of keyboards on the new album. How will you be able to recreate that live? Chris Lane: Well, most of the keyboard parts on the new album are like pads below the guitar. The only time that they take lead part is the same part that the guitar would be playing so I actually usually switch the riffs. We’ve done that for a long time actually with a lot of our live sets with the stuff from the new album. We basally just change what the guitar will play, what I play, to be prominent melodic instrument behind it. So that’s where the whole thinking of different kind of guitar effects and everything comes in. A song like “More Than The Moon” for instance, kind of a mid-tempo ballad, it’s thick with that pad sound, so you know, you have to add a lot of chorus and delay, and you kind of have this stereo sequence that fills out the sound in a different way but still fills out the sound to give it that same kind of vibe that we went for on the album. 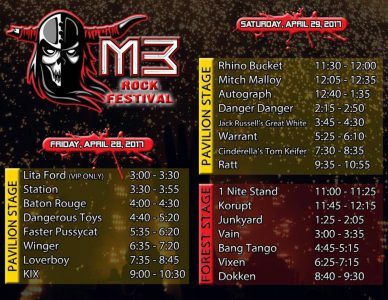 Sleaze Roxx: Now switching gears a little bit, last tear you had the opportunity to play the M3 Rock Festival. What I thought was pretty cool is that I think you’re one of the only “new” bands to play that festival outside the Maryland state [laughs] so to speak. 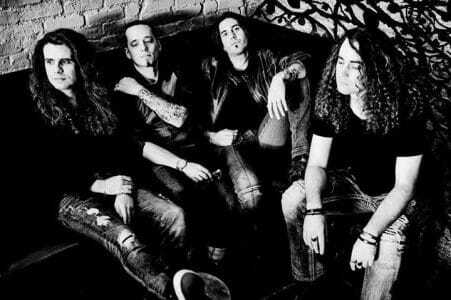 Sleaze Roxx: So how was that experience and how did you land the gig? Chris Lane: We got the gig by basically, M3 contacted our agent and they just worked it out, which was very cool. The experience was really cool. The experience was very different than a lot of the festivals that we have played and the reason for it is because… We’ve played a ton of festivals. We’ve done Rocklahoma many times. We’ve done Rock Fest, Music Fest. I think Rock Fest is actually the largest in the country. Normally, when we play a festival, it’s multiple stages and it’s in a field so you have a lot of logistical things like, “OK. You got to bring the bus around that way and then you load in and then you go down an alley.” M3 is really cool because it’s a venue. Its just an actual venue. It’s at the Merriweather [Pavillion in Columbia, Maryland, USA]. Everything is set up like a normal performance. The only thing that makes it like a festival in my opinion is just the fact that they have multiple bands. So it was a real pleasure because we were able to do so much more than what we normally can because how efficient it was. We were actually the first band and we loaded in in the loading dock, which is you know a miracle, because most festivals are usually in like a field so you kind of have to figure that out. And then we had our dressing room and we were able to go onstage. We were able to do press correctly and not have to run through the festival. It was a really cool experience. I was very very humbled by seeing how many Station fans came specifically to see us. There were banners and that was great because I know that we have fans in Maryland but like you know, it’s much different going to M3 than buying a $10 stage ticket somewhere else. That level of support is just absolutely amazing so that was really cool. 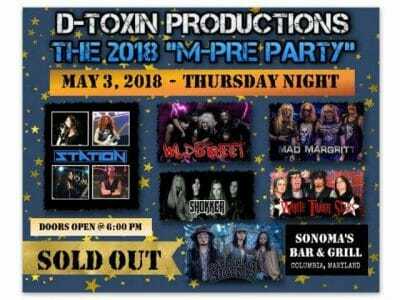 Sleaze Roxx: One of the precursors to the M3 Rock Festival is the M-Pre Party, which you guys have headlined now for the last couple of years except last year. 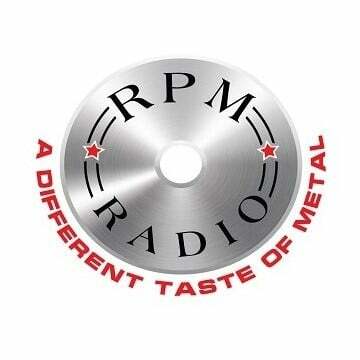 How do you think that has played an impact on Station’s ability to play the M3 Rock Festival? Chris Lane: That’s been huge. Our largest fan base I think is in Maryland and the reason for that is people like Dave Dillman who runs the M-Pre Party. I think we first headlined it five years ago and we did it so many times that the good thing was that the fans that we had made previously came back and saw the band grow. They saw us play on an EP and than they saw us play when we released an album. And then they saw us play when we were just in the middle of tour and then, this year, it will be the new album. That’s been you know so helpful because to be able to go back to the same group of people who than bring a friend, who than bring a friend, who than bring a friend, is the way you grow in a live circuit. So, it’s been like a real shot to the arm to say, “Hey, there’s an energized group of fan base that’s going to keep giving them something.” Plus they get the backdrop of M3. It’s a win-win for everybody. It’s really helped us tremendously. Sleaze Roxx: So tell me about that and whether there’s any other festivals on tap for this year. 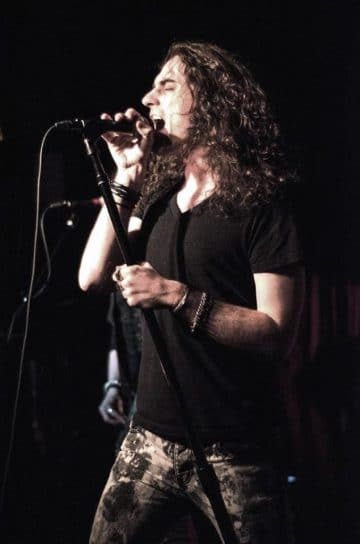 Chris Lane: The MelodicRock Festival is Friday, Saturday and Sunday of M3 weekend so what we are actually doing is we’re playing the M-Pre Party and then driving overnight [laughs] to Chicago to play. Chris Lane: Yeah, it’s going to be quite the trip. I know that our merch girls are not happy. Chris Lane: Actually, it’s not too too bad only because we play much later in the day. If we had to play at like 11:00 am, I would have to say that maybe that’s not possible. I don’t think that we are going to go on until well after like 8:00 [pm]. So I mean, there’s plenty of time to do that. I am looking forward to it. One of the things that I think is kind of cool is that on one hand, there’s very much a world stage scene going on with the style of music that we love. The flip side of it though is that Station… I’ve always kind of felt Station is kind of the odd ball in that group of people just because I feel like if you ask who the influences of a lot of the bands of our peers are, Mötley Crüe would come up as like one of the first ones. I love Mötley Crüe but if you said that to us, they wouldn’t be in the top 20 in terms of what we felt influenced the sound of the band. We’re fans of the band but it’s just now what drew us. For us, it’s more like bands like Journey and more like Pink Floyd, and Def Leppard and Boston. I feel that kind of gives its our own identity to play alongside bands like Crazy Lixx, which I personally really like. We stand out. They stand out to us. We stand out to them. It’s a cool thing. We’re not just like a bunch of the same bands playing, which I think happens sometime. 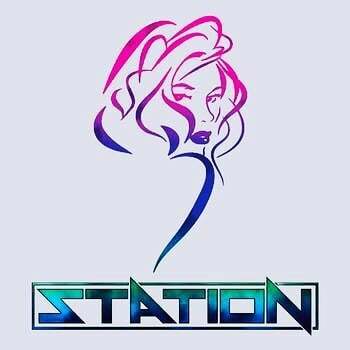 I am excited to represent Station and just add a different colour. Sleaze Roxx: Speaking of the music industry, I would think that if you guys would have came out in the ’80s, you would be one of the huge bands out there but it’s a different market. You’re like 30 to 35 years later. So what do you think about that thinking that if you had been 30 years earlier, I would say that you would be right up there with maybe even the Def Leppards and stuff. Chris Lane: You know, I think about this a lot and I personally — I don’t think so. For us, we obviously sound in that style of music but how do you top Def Leppard? In my opinion, had we come out at the same time as Def Leppard, because our styles of music are at least pretty similar in the sense that we play melodic rock, I don’t think that we sound like each other by any means. There would be a lot more competition within our world at least. In today’s world, I feel like we are so unique in what we do that it’s kind of hit or miss. On one hand, I think that our success would have been easier in the ’80s but I think that our ability to reach higher heights in the modern day is more likely. Only because, like us, love us, hate us, it doesn’t matter. You can’t argue that there are a bunch of Stations running around. So at that point, we kind of have a part of the market that’s all to ourselves because we can say to ourselves, “We do this.” You know what I mean? Not because there’s no one else necessarily who have done melodic rock but just the fact that we are the only one on the scene doing it the way we do it now. If we had been back in the ’80s, again, we don’t sound like anybody but all the bands play melodic rock. It would be like different varieties of the same kind of flavours while right now, we stand out because we’re the only ice cream cone. Sleaze Roxx: [Laughs] Fair enough. Is there any plans to go to Europe? Chris Lane: We’ve actually been talking about that — Europe and Japan. We have a fan base in Japan. We have a fan base in Europe. The problem is in order to actually make it happen and not lose a ton of money, and not waste our time, but not effectively tour. We have to have a lot more going on on the business side to bring us over there and it’s not so much interest, it’s just more coordination. So one of the really cool things that has happened in the last month or two is that with the new album and us running around like chickens with our heads cut off just trying to get everything ready, we have solidified a lot of things that are really going to help the band in the future — hopefully in the near future. Now that we are working with new management, working with better agents, everything is kind of falling into place. We have the tools to more properly plan rather than saying half assed — “Who wants to buy a plane ticket to London [laughs]?” — and going to try that. that was never going to work for us. Now that we have the ability to actually do things — you know, like a real band — I feel way more comfortable saying that we have so many more opportunities coming up that we can take advantage of. Sleaze Roxx: What are your plans for the rest of the year? Chris Lane: The album will be out on Friday the 13th [Interviewer’s note — the interview took place back on March 30th.]. The reason we chose that is because we joke that we are a very unlucky band sometimes in terms of how things fall out behind the scenes. So the logic was release it on “quote unquote” unlucky day and then we cancel each other out and we have luck. Chris Lane: This year will be a lot of touring but also a lot of events. We have a lot of stuff in store that’s just not us on the road. We are going to do a lot of things in New York, a lot of really cool events that I cannot really announce yet. They are going to take place over the summer. It’s just really going to be great. Some really special performances… That is going to be combined with like I said a lots of shows. I think right now, we already have 51 or 52 booked, half of them aren’t even announced. There will just be a lot of shows. We love playing live. I crave it you know. I love being on stage. We’re probably going to start work on what would be another album so a lot of stuff going on all at the same time. Sleaze Roxx: I am not going to let you off the hook on the “unlucky” stuff so you have to tell me why you guys joke around that you’re so unlucky. Chris Lane: You know what it is? It’s not that we are unlucky. We are very fortunate especially with like the fans and we’ve had a lot of great opportunities. We’re unlucky because stuff comes up sometimes that we are just like “Really?” For instance, we always joke about bus problems. We love our bus but there have been instances where there is a heat wave. Perfect example, last summer we were on tour and there was an unusual heat wave in Nashville. We were playing a show in Nashville and playing the next night in Cincinnati. So it’s like a 109 degrees [Fahrenheit] in Nashville. We get to Cincinnati [laughs] and all of a sudden, the bus is just not cooperating. It turns out that the heat melted some component — I don’t know anything about cars — but something on the bus that made it so that the air conditioner is not working. And so we were stranded in Cincinnati with this broken down business the middle of nowhere in a Wal-Mart parking lot. That kind of stuff happens to us. We have actually shown up to venues and our name is on the marquee and is misspelled. Chris Lane: [Laughs] And it will be like, “Great!” It’s just little things like that. We always joke that if the universe could figure out a way to subtlety kind of twist the knife, it will. Sleaze Roxx: That is unlucky. What’s the first single that we can expect? Chris Lane: The first single is going to be the first song on the album which is called “I Won’t Break Your Heart” and it’s kind of an upbeat kind of riff rock kind of song. It’s fun and it’s actually Pat’s, the singer, and Tony’s, the drummer, their favorite song on the album. That’s why we picked it. The music video for it will also debut tomorrow on the day that the album comes out. I am very excited about that too. We love making music videos and as now that we have experience doing so, we are doing cooler music videos, in my opinion. Videos that aren’t just the band performing on stage smiling. I love that stuff. “More Than The Moon” is out now! Sleaze Roxx: Why did you guys end up releasing the stand alone singles in between your last album in 2015 and your upcoming one? Chris Lane: Yes. That was kind of a weird thing. What happened was that we basically released the album into 2015 and then at the end of 2016, we had a conversation about getting ready for album two. We had taken on new management, different than we have currently, and they had suggested that instead of going right back into the studio — ’cause at the time, it was only a year and a half later — instead of going back in the studio, we were better off recording just like two songs, releasing them out to say like, “Hey. This is what is going on right now.” And touring on them to make it like we had this like invigorated scene so that when we release the album, everyone would be primed and ready. The problem was that I ran into some health problems and it took me out of commission for a couple of months so we were kind of not able to do any kind of serious touring at the beginning of 2017. So instead, we said, “OK. I can go into the studio and play the guitar.” We recorded the two songs in March and than time released them so we could basically say, “OK.” I think that we released the first one in May  and the second one in like November  and basically, just keep putting out new material that we had while we worked on the new album instead of having this incredibly busy touring schedule because last year, we played half the number of shows that we did in 2016 for that reason. Because I physically couldn’t and we were in the studio for three months actually making the album. So it worked out because I think had we saved the two songs — “All You Need Is A Heartbeat” and “Never Enough” — which I both really like, I feel like they actually wouldn’t fit on our new album only because they cover bases that we already covered on the album. It’s almost feels repetitive. You have two types of the same songs. Sleaze Roxx: Is there anything else that you’d like to cover that we haven’t spoken about? Chris Lane: I am very proud of the new album and I hope that everyone sees how much work that we have put into getting the sound of the album together. We took a lot of time to really craft what we wanted it to sound like. It’s a credit to the studio that we worked with — the same guys from the first album — Ray Marte and Anthony Lopardo. You know, the fact that they haven’t killed themselves or us because of it is a testament to their abilities. So you know, it was a really great experience and we’re going to go do it again. We’re now in the process of releasing music way more consistently. We have a very clear path to do so and we have a lot of music in us, and it’s something that I can’t wait to share with everyone. 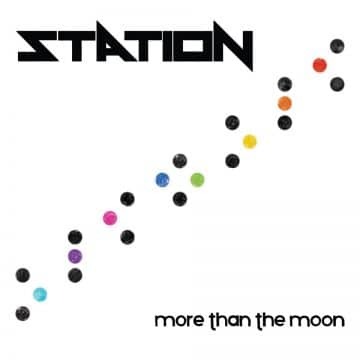 You can purchase Station‘s new album More Than The Moon at the group’s Bandcamp page.